Background: Helleborus niger L (Ranunculaceae) is used Ayurvedic and Unani systems and other herbal medicine systems. The roots of H. niger have a good medicinal value. Aims: To conduct a pharmacognostical and phytochemical study of H. niger. Materials and Methods: The pharmacognostical studies on roots including parameters such as taxonomical, macroscopic, microscopic characters, physico-chemical, ultra-violet analysis and phytochemical studies are established. Results: Macroscopically, the roots are brownish-black in colour, cylindrical in shape, feeble odour, slightly acrid taste with irregularly branched. Microscopically the root showed the presence of epidermis, air-chambers, fissure periderm, periderm, inner cortex, pith, phloem, xylem, vessels and xylem vessels. Microscopic examination of the powder showed the presence of parenchyma cells, parenchyma mass, periderm, cell inclusion, laticifer, lateral wall pith, perforation, xylem bundle and xylem elements. Ultra-violet and ordinary light analyses with different reagents were conducted to identify the drug in powder form. Physico-chemical evaluation established, Ash values - Total, acid insoluble, water soluble and sulphated ash values were 7.3%, 4.1%, 3.7% and 5.2%, respectively. Extractive values - Alcohol soluble, water soluble and ether soluble extractive values were 22.8%, 7.4% and 5.6%, respectively. Loss on drying was 3.3%. Preliminary phytochemical screening showed the presence of carbohydrate, glycoside, saponins, flavonoid, phytosterols, tannins and phenolic compounds. Conclusions: The results of the study can serve as a valuable resource of pharmacognostic and phytochemical information. This will serve as appropriate, standards for discovery of this plant material in future investigations and applications and also contribute towards establishing pharmacopoeial standards. The roots and rhizomes contain hellebrin, desgluco-hellebrin, hellebrigenin, bufatetraeno-lide, beta-ecdysterone and 5-beta-hy-droxyecdysterone. Traditionally, the H. niger root is used as hydragogue cathartic, anthelmintic; in epilepsy, dropsy, hypochondriosis, mania melancholia, chronic skin affections and worms. The powdered roots are given in dyspepsia and as a purgative., An Unani drug quantity sufficient (QS), containing H. niger and Anacyclus pyrethrum De Candolle (3:1), reduces the cholesterol level and the dose of insulin in diabetic patients. The plant extract, an anti-inflammatory agent, induces inhibition of the enzyme in the androsterone oxidation and 5- andro-stane -17 β-ol-3-one reduction reaction in rat liver in vitro. Literature survey did not provide sufficient information about pharmacognostical and phytochemical studies of this plant. The current work aims to contribute in solving the problems of controversial drugs prevalent in Ayurveda beside helping in laying down pharmacopoeial standards. Therefore, the present investigation was conducted with the objective of evaluating various parameters such as macroscopic, microscopic characters and phytochemical evaluation of the plant. H. niger (HN) plant was obtained from a local traditional healer in Erode, Tamil Nadu (India). The plant was identified by Prof. P. Jayaraman and a voucher specimen (Ref. No: PARC/2012/2177) was deposited in the pharmacognosy department herbarium, JKKMMRF's - Annai JKK Sampoorani Ammal College of Pharmacy, - B. Komarapalayam, Tamil Nadu. Taxonomic description, regional language names, habit and habitat of the plant and botanical descriptions were noted from the available literatures. In organoleptic evaluation, appropriate parameters like taste, odor, size, shape and color of the roots were studied. Care was taken to select healthy plant and normal parts. The required samples of different parts were cut and removed from the plant and fixed in FAA (Formalin-5 ml + Acetic acid-5 ml + 70% Ethyl alcohol-90 ml). After 24 hrs of fixing, the specimens were dehydrated with graded series of tertiary-butyl alcohol (TBA) as per the schedule. Infiltration of the specimens was carried by gradual addition of paraffin wax (melting point 58-60°C) until TBA solution attained super saturation. The specimens were cast into paraffin blocks. The paraffin embedded specimens were sectioned with the help of rotary microtome. The thickness of the sections were 10-12 μm. dewaxing of the sections was done by customary procedure. The sections were stained with toluidine blue as per the methods. Since toluidine blue is a polychromatic stain. The staining results were remarkably good; and some cytochemical reactions were also obtained. The dye rendered pink colour to the cellulose walls, blue to the lignified cells, dark green to suberin, violet to the mucilage, blue to the protein bodies, etc., Wherever necessary, sections were also stained with safranin and Fast-green and IKI (for starch). Glycerin mounted temporary preparations were made from macerated/cleared materials. Powdered materials of different parts were cleared with NaOH and mounted in glycerine medium after staining. Different cell components were studied and measured. In the physico-chemical evaluation, ash values, viz. total ash, acid insoluble ash, water soluble ash and sulphated ash and extractive values, viz. alcohol soluble extractive value, water soluble extractive value and loss on drying were determined as per standard procedures. The ash values represent the inorganic salts present in the drug. Extracts obtained by exhausting crude drugs are indicative of approximate measures of certain chemical compounds they contain, their diversity in chemical compounds, diversity in chemical natures and properties of the contents of drug. The percentage w/w values were calculated with reference to the air-dried drug. Phytochemical analyses were performed by preliminary phytochemical screening to identify various secondary metabolites present in the plant roots using the standard procedures described by Khandelwal. A small, perennial herb, about 30 cm in height. Rhizomes black, joined; leaves pale green, ovate-cun-eate, slightly toothed towards apex; flowers white or pink, usually borne singly on red-spotted peduncles. The roots are more or less detached from rhizomes, and mixed with it. The roots are numerous, unbranched, cylindrical in shape. 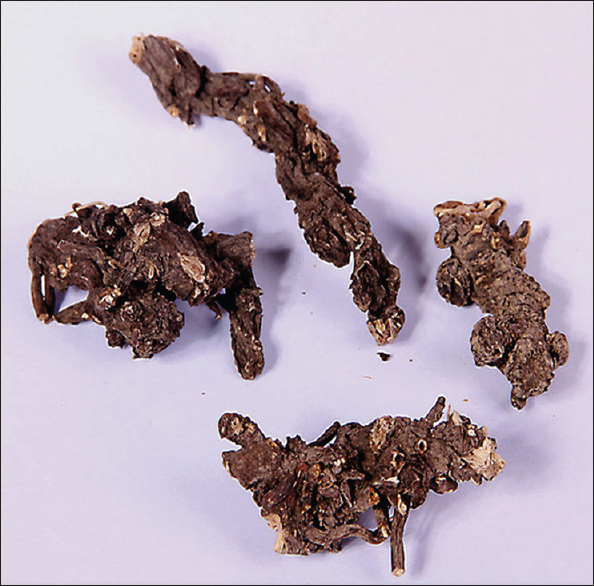 Both rhizomes and roots have a brownish-black colour; a feeble odour, which has been compared to that of senega root; and a bitterish, slightly acrid taste. A perennial herb with a cylindrical, brownish-black, knotted, brittle, fleshly, subterranean, bracteated, definite rhizome, with its numerous branches much interlaced, and giving off many stout, fibrous, straight, brown roots. Leaves from the extremities of the rhizome with red petioles, pedate, the lateral divisions deeply divided into 2-4 nearly separate lobes successively smaller towards the petiole, coriaceous, nearly evergreen, smooth, shining, dark-green above, paler and reticulated beneath, lobes coarsely serrate above. Flower-stalks terminating the rhizome, surrounded at the base with a loose entire bract, shorter than the leaves, cylindrical, smooth, tapering, mottled with pink below, 1-(rarely 2-) flowered, with 2 or 3 large, ovate, acute, concave bracts a little below the flower. Fruits follicular, sessile; pericarp leathery, dehiscing along the ventral suture. Seeds several, in two rows, oval, black, shining; embryo small, at the base of plentiful horny endosperm. In organoleptic evaluation, appropriate parameters such as taste, odour, size, shape, and colour of the roots were studied. They are brownish black in colour, cylindrical in shape with slight and feeble odour and pungent with slightly acrid taste. A perennial herb with a cylindrical, irregularly branched, brownish black roots. The roots are usually 3-6 cm in length and 5-8 mm in diameter. When broken across they present a central undivided, or very slightly stellate, woody axis or meditullium, of a whitish or yellowish-white colour. The roots produce a tingling sensation on the tongue [Figure 1]. Microscopically the root is circular in cross sectional outline, measuring 3.6 mm in thickness. The root consists of uniformly thick, continuous periderm, all along the circumference. The periderm in 250 μm thick. There are shallow wide, V-shaped fissures at several places of the periderm [Figure 1]. The periderm consists of several layers of thin walled, homogenous quadrangular phellem cells and about three layers of palladium cells [Figure 2]b and [Figure 2]c. Cortical zone is wide and it measures 900 μm of radial width. The outer part of the cortex includes two or three layers of tangentially stretched air-chambers [Figure 2]a. The remaining inner zone comprises angular, thin walled compact parenchyma cells. Many of the parenchyma cells contain tannins. The vascular cylinder is hollow and encloses wide pith. The vascular cylinder includes, thick spindle shaped segments with constructions in between the segment. 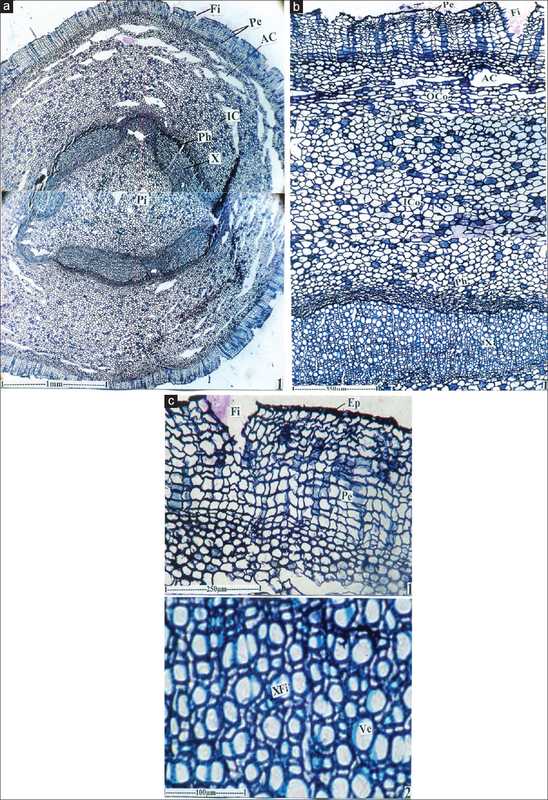 The segments have collateral phloem and xylem elements [Figure 2]a and [Figure 2]b. The phloem forms a thick cylinder outside the xylem cylinder. The phloem elements are small, compaer and and are darkly stained [Figure 2]c the xylem is densely distributed, compaer and diffuse. Xylem elements, are circular angular in outline. They are solitary and intermixed with xylem fibres. The fibres and fairly wide, thick walled and liquefied [Figure 2]c the vessels are 10-20 μm wide. Vessel frequency is 280/mm 2. Thick masses or solitary parenchyma cells are abundant in the powder. The cells vary in shape and size. They have dense, darkly stained amorphous inclusions [Figure 3]a. Large flakes of periderm cells (phellem cells) are occasionally found in the powder. The cells are tabular in shape, and are thick walled. They are homogenous with similar type of cells and are in compaer rows. The cells are 50-80 × 30-50 μm in size [Figure 3]a.
Laticifers are latex secreting and conducting canals distributed in the ground tissue. In the powder, laticifers are seen either associated with the lendle sheath cells or in an isolated condition. The laticifers are wide, thin walled, non separate and unbranched. They contain solid bodies of starch grains suspended in the latex [Figure 3]b.
Xylem elements are common in the powder. They are seen either in the form of continuous canal of vessels or broken individual vessel elements. The vessel elements are long, narrow and cylindrical. They have sealariform lateral walls pits which are wide and dense. The end wall perforation in simple, circular or elliptical and oblique. The vessel elements are 70-100 μm long [Figure 3]c.
Powdered drug under ultra-violet and ordinary light when treated with different reagent emitted various colour radiations which helps in identifying the drug in powder form [Table 1]. The physico-chemical evaluation, ash values, viz. total ash, acid insoluble ash, water soluble ash and sulphated ash and extractive values, viz. alcohol soluble, water soluble and ether soluble extractive values and loss on drying were calculated and recorded. The ash values, viz. total ash, acid insoluble ash, water soluble ash and sulphated ash values were 7.3%, 4.1%, 3.7% and 5.2%, respectively. Extractive values, viz. alcohol soluble, water soluble and ether soluble extractive values were 22.8%, 7.4% and 5.6%, respectively. The moisture content (Loss on drying) was 3.3%. The results of phytochemical screening of the various extracts of H. niger roots revealed the presence of carbohydrate, glycoside, saponins, flavonoid, phytosterols, tannins and phenolic compounds shown in [Table 2]. These secondary metabolites are known to possess various pharmacological effects and may be responsible for various actions of H. niger. To establish the identity, purity, safety and quality of herbal drugs, standardization is an vital tool. In order to standardize a drug, various macroscopic, microscopic, fluorescence analyses are done. Microscopic analysis is one of the inexpensive and the simplest methods to begin with establishing the accurate identification of the plant material. According to the world health organization (WHO) the macroscopic and microscopic description of a plant is the first step to estabilish the identity and the degree of purity of such materials and should be carried out before any tests are undertaken. Thus, the present work was taken up with an objective to lay down detail pharmacognostical and phytochemical standards that will contribute significantly to the quality control of H. niger. 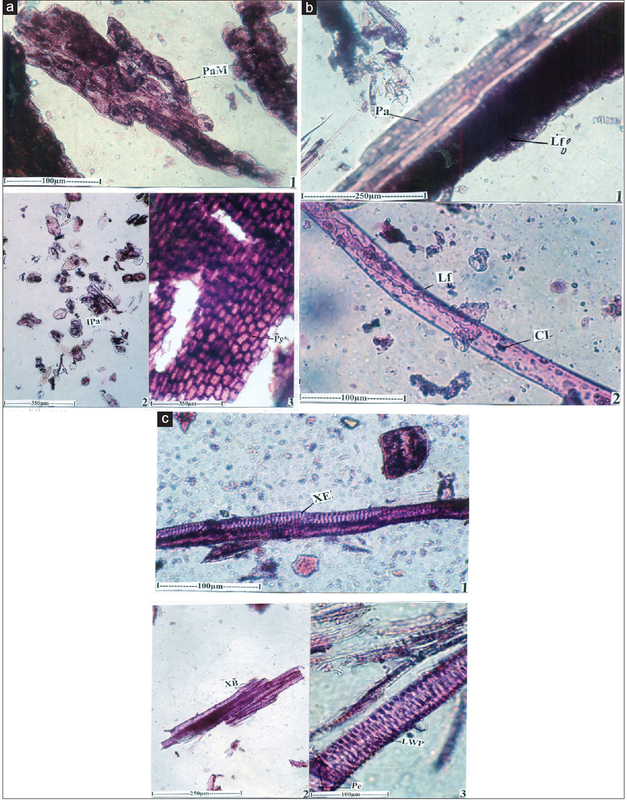 This is the first report for the macroscopy and microscopy of root of H. niger. Macroscopic evaluation is a qualitative evaluation based on the study of morphological and organoleptic characters of drugs and establishes diagnostic parameters. The microscopic studies of the transverse sections showed presence of air-chamber, fissures in periderm and inner cortex. Powder microscopy also plays an important role in pharmacognostical evaluation and sometimes may be an identifying parameter of herbal drugs. Powder microscopy revealed the characters such as cell inclusion, laticifer and lateral wall pits as the specified identification characters. Ash values of drug give an idea of earthly matter or the inorganic composition and other impurities present along with drugs. It is used as a reliable aid to detect adulteration. The total ash is particularly important in the evaluation of purity of drugs, i.e. the presence or absence of foreign inorganic matter such as metallic salts and/or silica. Percentage ash analysis was carried out and results showed the total ash value of the root to be higher than other ash values. Extractive values are preliminarily helpful for the determination of exhausted and adulterated drugs. They are also helpful to evaluate the chemical composition of the crude drug and also help in the estimation of specific constituents soluble in particular solvents., Among extracts alcohol soluble extractive value of root was higher than water soluble and ether soluble extractive values. Fluorescence is a vital phenomenon exhibited by various chemical constituents present in plant materials. If the substances themselves are not fluorescent, they may often be converted into fluorescent derivatives by applying different reagents. Hence some crude drugs are often assessed qualitatively in this way and it is an important parameter of pharmacognostical evaluation., The micro-chemical tests of the drug were carried out with different concentrated mineral acids, the colours produced by these reagents represent the presence of active constituents. The analysis of powdered drug under ultraviolet light establishes the colour of the drug, as such and after treatment with different reagents. Preliminary phytochemical screening showed the presence of carbohydrate, glycoside, saponins, flavonoid, phytosterols, tannins and phenolic compounds in various extracts of roots. Phytochemical screening suggests that, the root extracts of H. niger probably contain active agent(s) and this provides the basis for their use as a cure in folklore. The present study concludes for the first time, the complete pharmacognostical parameters of the root of H. niger. This will provide useful information for identification and to determine the quality and purity of the plant materials. It also provides data for identification of biologically active phytoconstituents, and pharmacopoeia standards for easy identification of H. niger and hence differentiating it from closely related species. These observations could be helpful in setting up of the diagnostic characters for the identification and preparation of a monograph of the H. niger and also contribute towards establishing pharmacopoeial standards. The authors are thankful to Prof. P. Jayaraman, Director, National Institute of Herbal Science, Chennai, for authentication of the plant for our study. Anonymous. The Wealth of India: Raw Materials Series. Vol. 3. New Delhi: NISCARI, CSIR; 2005. p. 251-2. Bentley R, Trimen H. Medical Plants. Vol. 1. New Delhi: Ajay Book Services; 2006. p. 5-7. Sammbamurthy AVSS. Dictionary of Medicinal Plants. 1st ed. New Delhi: CBS Publishers and Distributors; 2006. p. 153. Prajapati ND, Purohit SS, Sharma AK, Kumar T. A Hand Book of Medicinal Plants: A Complete Source Book. Jodhpur: Agrobios (India); 2007. p. 266-7. Khare CP. Indian Medicinal Plants: An Illustrated Dictionary. New Delhi: Springer Publications; 2007. p. 306. Board N. Compendium of Medicinal Plants. Delhi: National Institute of Industrial Research; 2005. p. 205-7. Nadkarni KM. Indian Plants and Drugs. New Delhi: Ajay Book Services; 2010. p. 158-9. Sass JE. Elements of Botanical Micro Technique. 1st ed. New York: McGraw Hill Book and Co.; 1940. p. 222. Johanson DA. Plant Micro Technique. 1st ed. New York: McGraw Hill Book Co.; 1940. p. 183-203, 523. O'Brien TP, Feder N, Mc Cull ME. Polychromatic staining of plant cell walls by toluidin blue-O. Protoplasma 1964;59:364-73. Evans WC. Trease and Evans: Pharmacognosy. 15th ed. London: Harcourt Publisher Limited; 2002. p. 313, 513-25, 538-47. Easu K. Plant Anatomy. 3rd ed. New York: John Wiley and Sons; 1964. p. 767. Easu K. Anatomy of Seed Plants. 4th ed. New York: John Wiley and Sons; 1979. p. 550. Kokoski CJ, Kokoski RJ, Slama FJ. Fluorescence of powdered vegetable drugs under ultraviolet radiation. J Am Pharm Assoc Am Pharm Assoc 1958;47:715-7. Chase CR Jr., Pratt R. Fluorescence of powdered vegetable drugs with particular reference to development of a system of identification. J Am Pharm Assoc Am Pharm Assoc 1949;38:324-31. Khandelwal KR. Practical Pharmacognosy. 19th ed. Pune: Nirali Prakashan; 2008. p. 149-56, 157-9. ITIS. Helleborus Niger. Available from: http://www.itis.gov/servlet/SingleRpt/SingleRpt?search_topic=TSN&search_value=195028. [Last accessed on 2017 July 14]. Stephenson J, Churchill JM. Medical Botany. Vol. 1. London: John Churchill; 1831. p. XI. Hamilton E. The Flora Homoeopathica. London: Homoeopathic Trust; 1852. p. 285-91. Singh S, Manchawal L, Chauhan MG. Pharmacognostic study of male leaves of Trichosanthes dioica Roxb. with special emphasis on microscopic technique. J Pharmacogn Phytother 2010;2:71-5. Anonymous. World Health Organisation (WHO): Quality Control Methods for Medicinal Plant Materials. Geneva: WHO; 1998. Nayak BS, Patel KN. Pharmacognostic study of Jatropha curcas leaves. Int J Pharm Tech Res 2010;2:140-3. Thomas S, Patil DA, Patil AG, Chandra N. Pharmacognostic evaluation and physicochemical analysis of Averrhoa carambola L fruit. J Herb Med Toxicol 2008;2:51-4. Kumar S, Kumar V, Prakash O. Pharmacognostic study and anti-infl ammatory activity of Callistemon lanceolatus leaf. Asian Pac J Trop Biomed 2011;1:177-81. Kokate CK, Purohit AP, Gokhale SB. Practical Pharmacognosy. 4th ed. New Delhi: Vallabh Prakashan; 2006. p. 107. Kumar D, Kumar K, Kumar S, Kumar T, Kumar A, Prakash O. Pharmacognostic evaluation of leaf and root bark of Holoptelea integrifolia Roxb. Asian Pac J Trop Biomed 2012;2:169-75. Ansari SH. Essentials of Pharmacognosy. 1st ed. New Delhi: Birla Publications Pvt., Ltd.; 2006.